It is important to know where Mercury is positioned on our birth chart. This planet rules the way we think, speak, act and react in our relationships based on our intellect. Get to know more about Mercury in Cancer. Water is the element of Cancer (just as Scorpio and Pisces) and the Moon is its ruling star. The combination of the element water with Mercury makes these people hardly use reason without having the emotion involved. 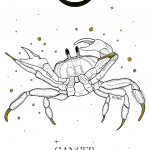 And Cancer being the most sentimental sign of the zodiac, this is a somewhat delicate situation. Those who have Mercury in Cancer will begin to structure their thoughts from the very beginning out of emotion. They can not simply rationalize things because they are very intuitive and need to feel what goes on inside, with them and with others. To make a decision, these people will probably make use of the pros and cons lists. They will list not only the benefits and losses, but above all, how they will feel in each imaginary scenario. Because everything will always have to make sense in their lives and not just be good or bad. Because Cancer is a sign closely tied to the past, they archive events throughout their lives as the best of librarians. And from them, they create emotional patterns that will influence their reason. If the emotional patterns are positive, that is okay. However, Mercury in Cancer has a tendency to be easily depressed about things. It will be those people who, even when they are dissatisfied with the decisions they make, will not go back because they feel intimately connected with what they have decided. Logical reasoning will be affected by so much emotion that this individual carries. However, we can not say the same of their memory. Because they are so attached to the past, their memory will function like the elephants’. Having good memory can be very helpful at times, but what happens with Mercury in Cancer is that they suffer from attachment to bad memories. They are so present in the current lives of these people that they even seem to live in another age. It will be those people who do not seem to evolve and who will say words based on situations that occurred many years ago. The issue might has already been surpassed by all but by them. These very emotional beings have their thoughts in the unconscious zone of the mind. It means that because they are so emotionally attached to others, they are unconsciously very influential. They can change their mind all the time just because someone dear has tilted them to that side. This can give them an image of false people with no personality. But we guarantee that anyone who has Mercury in Cancer does not do it wrong. Their nature is too delicate and innocent to have these kinds of hidden intentions. But if there is anything hidden in this Mercury it is the ability to manipulate others. It is not unusual for this sign to use the words in its favor to become a victim, for example. After all, they know exactly how to use the emotions to make their speech more appealing or convincing.